An audiogram is a graph that shows the audible threshold for standardized frequencies as measured by an audiometer. The Y axis represents intensity measured in decibels and the X axis represents frequency measured in Hertz.The threshold of hearing is plotted relative to a standardised curve that represents ‘normal’ hearing, in dB(HL). Audiograms are set out with frequency in hertz (Hz) on the horizontal axis, most commonly on a logarithmic scale, and a linear dBHL scale on the vertical axis. For humans, normal hearing is between −10 dB(HL) and 20 dB(HL), although 0 dB from 250 Hz to 8 kHz is deemed to be ‘average’ normal hearing. 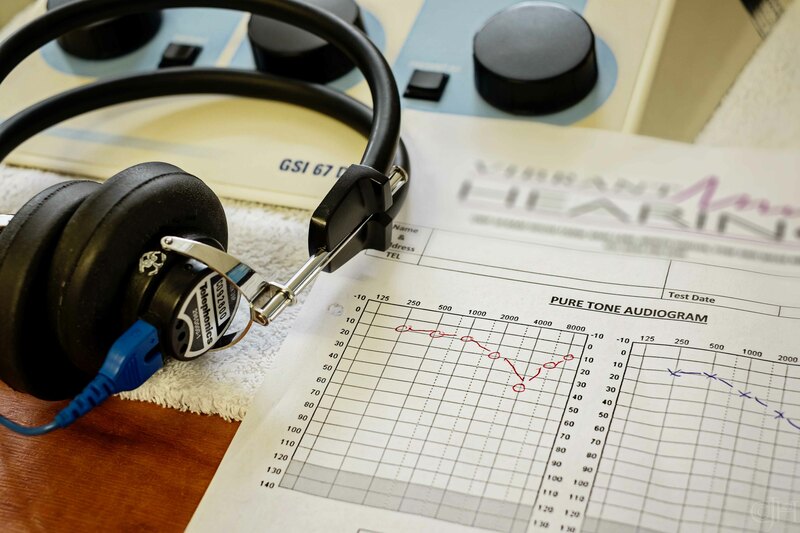 Audiograms are produced using a piece of test equipment called an audiometer, and this allows different frequencies to be presented to the subject, usually over calibrated headphones, at any specified level. Most commonly, “conventional” audiometry (utilising audiograms up to 8 kHz) is used to measure hearing status. Ideally the audiogram would show a straight line, but in practice everyone is slightly different, and small variations are considered normal. Larger variations, especially below the norm, may indicate hearing impairment which occurs to some extent with increasing age, but may be exacerbated by prolonged exposure to fairly high noise levels such as by living close to an airport or busy road, work related exposure to high noise, or brief exposure to very high sound levels such as gunshot or music in either a loud band or clubs and pubs. Hearing impairment may also be the result of certain diseases such as CMV or Ménière’s disease and these can be diagnosed from the shape of the audiogram. Posted in 366, Fuji, fujiXT1, medical science, Numbers, photography, still life, UncategorizedTagged 366, audiogram, audiometry, dBHL, fraggle, Fuji XT-1, hearing test, Numbers, photography, September2016, still lifeBookmark the permalink. I had no idea what an audiogram was, FR. Now I know! Lovely crisp and clear photo indeed! Comment disappeared again. Happens a lot on your site. I don’t always get notifications about them either, and sometimes they turn up in spam! I didn’t know what it was either. How is a photography blog always so infuriatingly educational? I love charts and data – was immediately attracted by your photo. No I also know about audiograms – I think! More learning today – I didn’t know any of this! Ha! I hope it doesn’t burst over the next ten days!